This story about what I wish I’d known about painting kitchen cabinets has a happy ending…because I finally invested in paying someone to paint them after royally screwing up the paint job myself. There are a lot of awesome tutorials out there about how to paint kitchen cabinets, and I wish I was that person who embraced DIY and loved the tedious steps involved in sanding, prepping, taping, priming, and painting. But honestly, after attempting to do it ourselves, my husband and I pretty much ran screaming to the professionals and threw our checkbook at them to make it right. And it was money well spent! As a designer, I always recommend talented professionals to get the job done. I finally realized it should be no different in my own home. 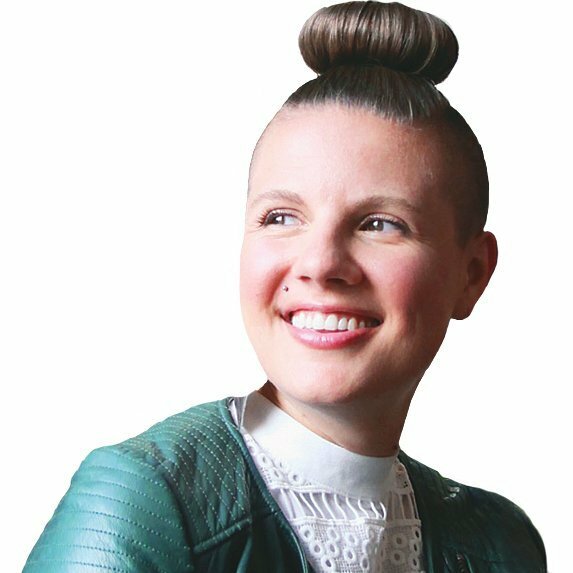 I’m Lesley Myrick, welcome to Bust Out of Boring, my weekly show every Wednesday at noon CT where I help you bust out of a boring home and create something amazing. 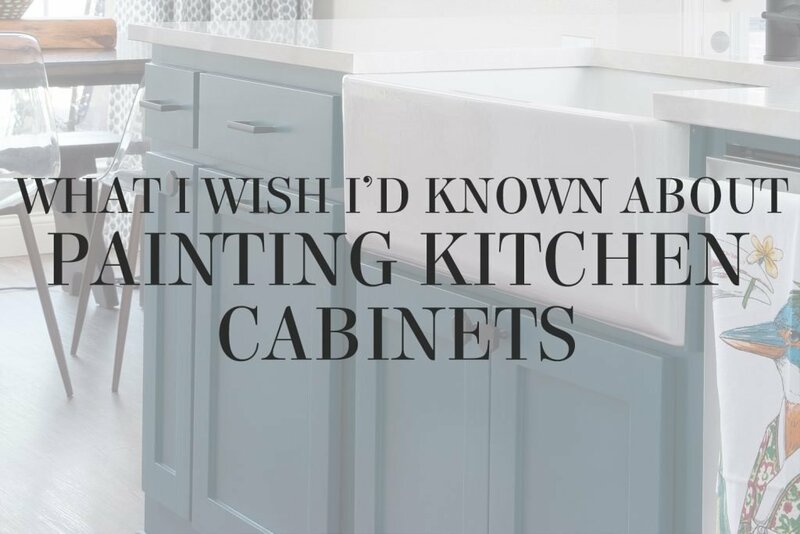 and we’re going to chat about what I wish I’d known about painting kitchen cabinets. It’s not about choosing color – color was easy! – but here is what I wish I had known about painting kitchen cabinets. So clearly, if we’re starting with the topic of “what I wish I’d known”,I made a mistake. We recently repainted our kitchen. The cabinets were white, kinda dingy, kinda old. We wanted to give them a fresher, brighter coat and paint the lower cabinets a really fun color – soon to be revealed on the blog and social media. And we were crafty, and did it ourselves! Which there ain’t no shame in that game, but I did not think through all the work, all the materials, all the ALL THE THINGS that we would need to do it right. was going from oil-based paint that was already on the cabinets to latex. Well, you can buy primers that will go over an oil base and will allow you to put on latex paint. However, the results that we got were not the most durable, were not the strongest, and we very quickly had issues with the finish being funny, with things getting chipped and dinged and scratched, and all the hard work my awesome husband put into it very quickly just looked…”meh”…and fell really flat. that’s kind of hard to learn once you’ve put a little money and put a little time into something. You get so excited for this end result and it just doesn’t work the way you wanted it to. 1. The right paint and the right process matters. Cabinetry isn’t something that you can just slap up a fresh coat of paint on and hope it’s gonna last. Cabinets take a hella lot of abuse and they really need to be done well, done with the right materials, the right paint that’s going to cure and be strong on surfaces and not something that can get dinged up when cupboard doors are opened and shut. 2. Painting the kitchen cabinets ourselves was not a worthy DIY project. This really is something that involves a lot of prep, a lot of labor, and a lot of time. As a working mom with two young kids, we need our kitchen! Having it torn up with us taking a week to do a job that professionals could do in three days really wasn’t worth the cost savings. I’m so grateful to have hired our amazing painting crew to tackle our kitchen which is now 100% done – without paint chipping! It looks amazing and I’m so excited to share that with you guys soon. drop a line in the video comments on Facebook. I’d love to hear if you have any experience painting kitchen cabinets and if yours went a little bit better than mine or if you found similar pitfalls in terms of trying to do it “on the cheap” and finding that it wasn’t worth the time or energy.